Louise - Every large building or venue has an evacuation procedure to ensure that everyone stays safe. 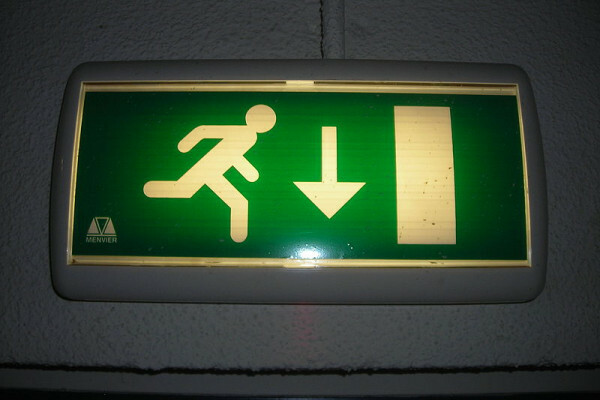 Most offices and schools provide lots of information and will have regular fire drills to make sure everyone knows what to do in the event of an emergency. But this isn't the case in many public places and obviously, simply isn't an option in preparation for the Olympics. Now, with that in mind, we need other means of understanding crowd behaviour and guiding people to safety. To find out more, we're joined by psychologist, Dr. Clifford Stott who currently works for Crowd and Conflict Management. Dr. Stott, how did you end up doing that? Clifford - Studying crowds? I came to it from a personal interest really. I spent a lot of times on demonstrations when I was younger and was fascinated by crowd dynamics. Coming across the work of a guy called Steve Reicher, I started to read that when I was studying for a psychology degree, I found that stuff fascinating and kind of got sucked into the world of crowd psychology. Quite an obscure world, unusual, but very, very interesting, very, very stimulating ideas, and a great field to work in. Louise - When we're talking about studying about crowd psychology and learning about how crowds interact and how they work, what can we actually do to learn about that? Clifford - First and foremost, you have to make sure that you look at them in the right way theoretically. The trouble with our understanding a crowd psychology is that we're polluted, if you like, by outdated ideas. The thing about crowd psychology is that crowd psychology is a bit political. It has a political implications; the way that we understand the riots in the summer for example, has profound political implications in terms of governmental responsibility for things that sparked the riots, policing, all those kinds of things. So, we have this way of looking at the crowd that treats the crowd as if it's a bit irrational, as if it's a thing of primitive psychology. And where we study crowds, what we do is to treat them meaningfully and in order to study them, we go to crowd events, we take part in crowd events, we interview people who are in crowd events, and use that kind of data to build our understanding of how crowds work. So, we look at how they behave and then we relate what we understand about the psychology, which we're getting through analysing what people say, to make a model of how psychological processes can help us to account for what crowds do, why they do what they do, and more importantly, when they're going to do things. It's that predictive dimension that's the most important thing when we come to trying to understand crowds. Louise - Obviously, there are different sorts of crowds. You mentioned the riots, but the crowds at the Olympics, I'm assuming those are going to be somewhat different. Is there anything special about them? Clifford - Well, I think the first thing to do is to recognise that we need to draw a distinction between what we call physical aggregates of people and psychological crowds. Just because people are together in the same physical location like they will be in the Olympic village doesn't mean to say that they're a psychological crowd. They're just a physical aggregate. Really, what we do is to try and understand that psychological component to crowd behaviour. And when we look at it, we're looking at collective action. Not lots of individuals behaving individually in terms of their own individuality in the same place at the same time, but that moment within a physical crowd where everybody starts to do the same thing - where a goal goes in and there's a cheer or a gold medallist scored and there's a cheer. That kind of collective action is what we're trying to actually explain in crowds. Not just simply the idea that when people get together in crowds, they become a single psychological crowd because that's quite simply not the case. Louise - Sure, so obviously, with the Olympics, we're going to be looking more at small groups of people who will be going along with say, a group of their friends or their family, and it's when something big happens that they all join together and think of themselves as part of the much larger group. Clifford - Yes, absolutely. I think the best example is to think of it in terms of national identity. People will go in to the Olympic village and a large number of them is going to be British in terms of their identity. When they come to the village, they're not going to see themselves so much in terms of that Britishness. But certainly, when we score some of those gold medal victories and people start to cheer and to see themselves and to celebrate their British identity, they become part of a psychological crowd that's defined in terms of that single social identity. It's that transition from the individual to the social identity that underpins the basis for why people can behave collectively when they do. Louise - How can that help us if there's an emergency? We know from the July 7/7 bombings a few years ago that people will group together and help each other out in emergency situation. Is there a way we can help that to happen? Clifford - When we are thinking about mass emergencies, I think that when we look at Olympic crowds, we don't really have a thought in our minds about a disorderly crowd, a kind of conflictual crowd. We think much more in terms of safety and security of large numbers of people in the Olympics venue. We've already had a discussion today on this programme about some of the potential threats there, this notion of some kind of biological or chemical contaminant, some kind of terrorist incident. Clearly, a very unpleasant set of ideas to be discussing, but if something like that were to happen, there are some very profound things that we need to understand about what happens to people psychologically in those kinds of physical aggregates. And usually, what we do is to look at that psychology in terms of our common sense assumptions. And of course, when one thinks about common sense assumptions of crowds and mass emergency, the first thing that comes to mind is the notion of panic. We think crowds panic. And when we think about why people get injured or indeed unfortunately die in these kinds of mass emergencies, say for example a nightclub fire or some kind of other stadium disaster, we tend to think that they die because they all rush for the exit at the same time, that somehow, the crowd psychology takes us over. We all become selfish and emotional, and irrational, and while we might be able to normally orderly get through this door, because we all rush to it at the same time in this mad, mass panic, we all can't get through it and therefore, that's what kills us, as if the crowd psychology is what kills us. Actually, the evidence doesn't bare that out. What we see is a very, very different phenomena. That people in the context of mass emergencies are very orderly. They're very rational. They're very helpful and what we see there is a situation of trying to promote collective psychology rather than undermine it. We shouldn't see the crowd as a problem in mass emergencies. We see actually the crowd as a solution. Louise - So really, we just need to let the crowd do what it's going to do and not panic, and just let people know if there's an emergency and we need to get them out. Clifford - Well, I think this is part of what we need to understand about how to handle mass evacuations - because we need to give people practical information. We need to try and promote a collective psychology in a physical aggregate. They might not actually have a crowd psychology and it's that absence of crowd psychology that's part of the problem. Where we have a sense of collective identity, we tend to see ourselves as similar to those people around us. And we tend to help more, we tend to cooperate, we tend to be more orderly, and more ordered about how we go about an evacuation. If people trip over we're more likely to help them up, and help the flow of the traffic through a particular location. So it's all these things that flow from a collective identity, but perhaps one of the most important is what we might call validation. If you think about yourself in a situation where you're at work and you hear a fire alarm go off, what do you do? You tend to think, "Okay, not again. Another fire drill." And how do you know that that's a fire drill and not an actual emergency? And what we know is that one of the biggest predictors of whether people survive mass emergencies or not is recognising the problem in the first place. And really, when we're looking in a situation where an alarm goes off, what we tend to do is to look to other people, look to their responses, and once we get to a point where everybody is beginning to recognise, "Hang on a minute. Maybe this is a problem. Perhaps we got to get out of here." That's when we go. So, promoting that sense of collective cooperation, that sense of identity creates an environment where we're much more capable of talking to each other, validating the situation, and actually getting to grips with what the nature of the problem is, in order that we can start to respond to it. So that process of collective psychology is incredibly helpful and indeed is the root to what we call in this environment, 'resilience'. Louise - Fabulous! And that's exactly what we need. Thank you very much, Clifford. That's Crowd and Conflict Management's Dr. Clifford Stott.